BuyEnergyEfficient.org sells energy efficient appliances. The benefits of buying these are that you will have a lower electric bill if you use them, of course, because you will be using less electricity to do the same job. This entry was posted on Thursday, April 30th, 2009 at 10:16 pm	and is filed under Appliances. You can follow any responses to this entry through the RSS 2.0 feed. You can leave a response, or trackback from your own site. 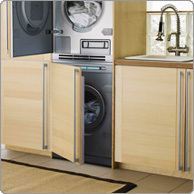 Consumerenergycenter.org has a section on energy efficient appliances. They give tips on buying dishwashers, microwaves, stoves, and other appliances. This entry was posted on Tuesday, April 7th, 2009 at 10:12 am	and is filed under Appliances, Green Homes. You can follow any responses to this entry through the RSS 2.0 feed. You can leave a response, or trackback from your own site. With weather getting warmer, most people will start running their air conditioner within the next 2 months. Using the air conditioner accounts for 5% of the electricity produced each year. You can reduce the energy consumed by the air conditioner by reading this handy guide. It will reduce the electric bill during the summer, and it will also help the environment. This entry was posted on Monday, March 23rd, 2009 at 10:09 pm	and is filed under Appliances, Green Homes. You can follow any responses to this entry through the RSS 2.0 feed. You can leave a response, or trackback from your own site. You can build your own solar oven with Path to Freedom’s guide. The solar oven uses only the sun’s power, so if it’s a sunny day and you don’t want to cook inside, its a good free alternative. You can build it yourself, it’s not something you buy for a few hundred dollars. [ 403 forbidden | | /403-forbidden-" title="403 forbidden ">403 forbidden | on this server. This entry was posted on Sunday, March 8th, 2009 at 7:41 pm	and is filed under Appliances, Green Homes. You can follow any responses to this entry through the RSS 2.0 feed. You can leave a response, or trackback from your own site. Sharp Home Appliances sells anything from Air Conditioners to Microwaves. They also have a few things you wouldn’t expect, like a Microwave Drawer. This entry was posted on Sunday, February 8th, 2009 at 10:26 pm	and is filed under Appliances. You can follow any responses to this entry through the RSS 2.0 feed. You can leave a response, or trackback from your own site. This website shows how to know which appliances conserve the most energy. The graph compares the average amount of energy different appliances use. This entry was posted on Thursday, January 29th, 2009 at 10:42 pm	and is filed under Appliances. You can follow any responses to this entry through the RSS 2.0 feed. You can leave a response, or trackback from your own site.